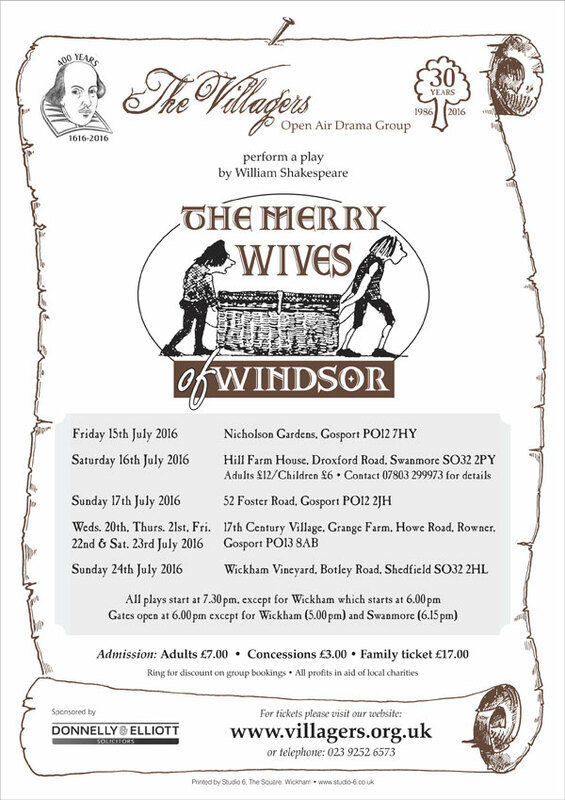 To mark our thirtieth year - and the 400th anniversary of Shakespeare's death, The Villagers did two sets of performances of our production of The Merry Wives of Windsor. We did three performances in Portsmouth in April and our usual summer run in late July. The April performances were in association with Portsmouth University and Much Ado About Portsmouth. The Cast list for the April performances can be found here and photos of the production can be found here. The Cast list for the July performances can be found here and photos of the production can be found here. Falstaff arrives in Windsor very short on money. He decides, to obtain financial advantage, that he will court two wealthy married women, Mistress Ford and Mistress Page. Falstaff decides to send the women identical love letters and asks his servants – Pistol and Nym – to deliver them to the wives. When they refuse, Falstaff sacks them, and, in revenge, the men tell Ford and Page (the husbands) of Falstaff's intentions. Page is not concerned, but the jealous Ford persuades the Host of the Garter Inn to introduce him to Falstaff as a 'Master Brook' so that he can find out Falstaff's plans. Meanwhile, three different men are trying to win the hand of Page's daughter, Anne Page. Mistress Page would like her daughter to marry Doctor Caius, a French physician, whereas the girl's father would like her to marry Master Slender. Anne herself is in love with Master Fenton, but Page had previously rejected Fenton as a suitor due to his having squandered his considerable fortune on high-class living. Hugh Evans, a Welsh parson, tries to enlist the help of Mistress Quickly (servant to Doctor Caius) in wooing Anne for Slender, but the doctor discovers this and challenges Evans to a duel. The Host of the Garter Inn prevents this duel by telling both men a different meeting place, causing much amusement for himself, Justice Shallow, Page and others. Evans and Caius decide to work together to be revenged on the Host. When the women receive the letters, each goes to tell the other, and they quickly find that the letters are almost identical. The "merry wives" are not interested in the ageing, overweight Falstaff as a suitor; however, for the sake of their own amusement and to gain revenge for his indecent assumptions towards them both, they pretend to respond to his advances. This all results in great embarrassment for Falstaff. Mr. Ford poses as 'Mr. Brook' and says he is in love with Mistress Ford but cannot woo her as she is too virtuous. He offers to pay Falstaff to court her, saying that once she has lost her honour he will be able to tempt her himself. Falstaff cannot believe his luck, and tells 'Brook' he has already arranged to meet Mistress Ford while her husband is out. Falstaff leaves to keep his appointment and Ford soliloquises that he is right to suspect his wife and that the trusting Page is a fool. Again Falstaff goes to meet the women but Mistress Page comes back and warns Mistress Ford of her husband's approach again. They try to think of ways to hide him other than the laundry basket which he refuses to get into again. They trick him again, this time into disguising himself as Mistress Ford's maid's obese aunt, known as "the fat woman of Brentford". Ford tries once again to catch his wife with the knight but ends up beating the "old woman", whom he despises, and throwing her out of his house. Black and blue, Falstaff laments his bad luck. Eventually the wives tell their husbands about the series of jokes they have played on Falstaff, and together they devise one last trick which ends up with the Knight being humiliated in front of the whole town. They tell Falstaff to dress as "Herne, the Hunter" and meet them by an old oak tree in Windsor Forest (now part of Windsor Great Park). They then dress several of the local children, including Anne and William Page, as fairies and get them to pinch and burn Falstaff to punish him. Page plots to dress Anne in white and tells Slender to steal her away and marry her during the revels. Mistress Page and Doctor Caius arrange to do the same, but they arrange Anne shall be dressed in green. Anne tells Fenton this, and he and the Host arrange for Anne and Fenton to be married instead. Although he is embarrassed, Falstaff takes the joke surprisingly well, as he sees it was what he deserved. Ford says he must pay back the 20 pounds 'Brook' gave him and takes the Knight's horses as recompense. Slender suddenly appears and says he has been deceived – the 'girl' he took away to marry was not Anne but a young boy. Caius arrives with similar news – however, he has actually married his boy! Fenton and Anne arrive and admit that they love each other and have been married. Fenton chides the parents for trying to force Anne to marry men she did not love and the parents accept the marriage and congratulate the young pair. Eventually they all leave together and Mistress Page even invites Falstaff to come with them: "let us every one go home, and laugh this sport o'er by a country fire; Sir John and all".